Six years ago, Peter van den Hoven wrote the following article about Saint Brendan, an adventurous and seafaring Irish monk well known in the Middle Ages but lesser known today. This is followed by a recent article by Henry Drost from the Dutch newspaper, the Harlinger Courant. The stories are told together. Although Ireland proudly lays claim to St Brendan, as evidenced by the bronze statue of the saint gazing out over the Bay of Bantry in County Cork, the Dutch can boost of having the Reize van Sinte-Brandaan (The Travels of St Brendan), a manuscript written in ‘Middelnederlandse’, a language spoken in the 1200-1500, that falls between Old Dutch and the current Dutch language. 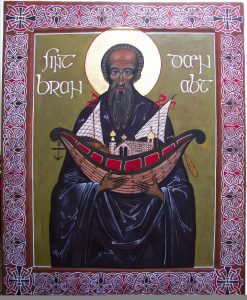 The historic St Brendan was an Irish monk and abbot who, together with a group of monks, took to the seas in search of Hy Brasail or the Island of the Blessed. A tale of their adventures is recounted in the 9th century manuscript (dates vary according to sources), Navigatio Sancti Brendani Abbatis, Latin for The Voyage of St Brendan the Abbot. One of the many legends and myths about St Brendan has it that the monk tossed a book into the fire because he refused to believe what was contained in it. An angel commanded him, like Noah, to build a vessel and make a trip around the world – together with his fellow monks – so he could see with his own eyes the wonders that were conveyed in the book. The voyage which lasted seven to nine years depending on the source you read, was filled with many exciting and, perhaps, mythic adventures; encounters with whales, “we were raised up on the back of sea monsters” and icebergs, “we passed by crystals that rose up to the sky”. In 1994, Willem Wilmink, a Dutch poet and writer, created a marvelous translation based on the original text. 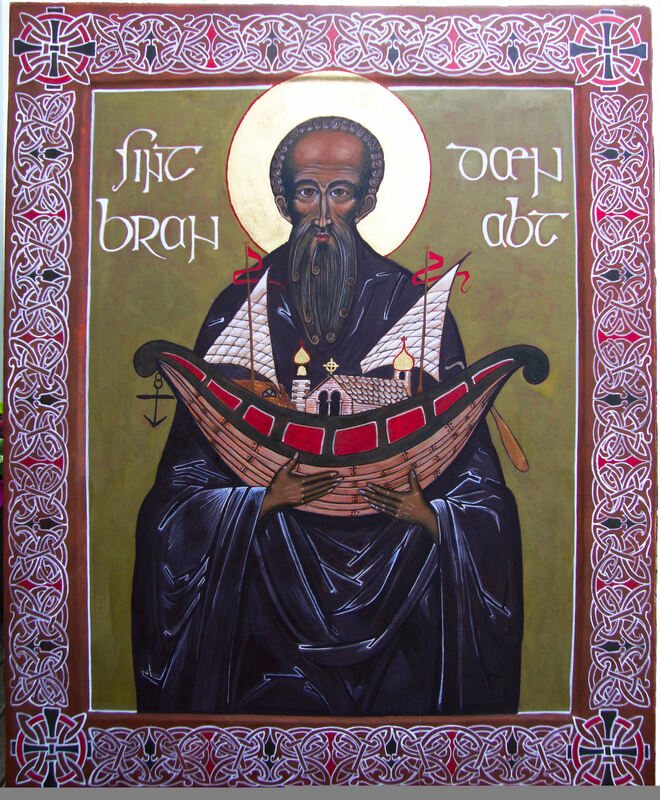 In Ireland, he is popularly known at St Brendan the Navigator and has become the patron saint of seafarers. He was born around CE 484 in Annaghdown near Tralee, County Kerry and died in the same village in 577 at the age of 93. St Brendan is buried in the cathedral at Clonfert, County Kerry where 1500 years ago he established a famous monastery. Brandaris, the oldest lighthouse in the Netherlands, located on Terschelling, one of the country’s northern islands, some believe was named after the Irish monk, known in Holland as Sint Brandaan. That came to pass because the tower of the eponymous church, since reclaimed by the sea, was used as a beacon – an early lighthouse – for ships as the importance of commercial trade developed. The Vlie and Stortemelk formed a strait to the North Sea as the importance of commerce in the ports on the former Zuyder Zee grew during the period of the Hanseatic League, its heyday from 13th to the middle of the 15th century. Anglo-Saxon monks found their way to the lowlands and converted the inhabitants bringing their saints, such as St Brendan, with them. As a land of seafarers like him, we can assume he was readily embraced by the Dutch. When the author visited Terschelling, he was disappointed to discover that the Roman Catholic Church no longer acknowledged the monk and there were no images of him. Since he has reported that the parishes of Vlieland and Terschelling have been united under the patronage of St Brendan. In order to keep alive the memory of St Brendan, the patron saint of the Roman Catholic community in Terschelling, St Peter the Fisherman’s Church in Midsland was presented an icon of the monk by Peter van den Hoven, an iconographer. Shortly, the icon will be given a place of honor in the church. This coincides with the upcoming merger of the parishes of Terschelling and Vlieland into the larger community of North West Friesland. 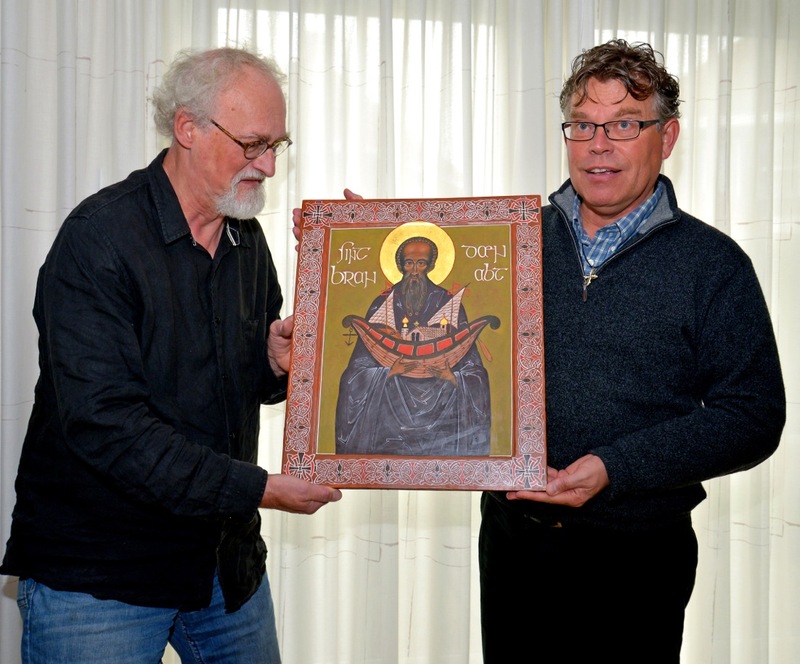 Father Sipke Draisma, pleased with the thoughtful gift, will keep the icon in Bolsward until the time it can be placed in the Midsland church. Once again, St Brendan, patron saint of seafarers, will watch over the island communities. Beginning his career as an etcher, Peter van den Hoven studied various medieval handbooks to learn traditional tempura techniques. Currently, in addition to teaching, he focuses on mainly religious themes expressed in his icon paintings. Among his subjects are the Visions of Ezekiel and Daniel as well as Mary with the Child Jesus and John. Many of his works have been consecrated by a Russian Orthodox priest. The Gorssel-based artist, originally from Brabant, a city in the south of the Netherland, specializes in icon painting, a demanding and time-consuming technique that uses, among other things, pure gold leaf. During a tour of Ireland, van den Hoven came across the statue of the popular monk and recalled the story of the voyage of St Brendan. This tale weaves elements such as 12th century mysticism and ‘visionary literature’ together with Irish maritime sagas told and retold since as early as the 7th century. In the Netherlands, these ‘Middelnederlandse’ narratives took on a life of their own, often differing greatly from the Latin originals. The oldest known reprint of these many and varied folk tales is around 1476, but editions continue to appear to date. In 1682 the tale of St Brendan was included in the popular book Wonderbaarlyke en Ongeloofelyke Reizen, along with the journeys of legendary figures such as Pliny, Lucian and Alexander the Great. Some believe the Brandaris lighthouse in Terschelling may have referred back to St Brendan. On a visit to the island, van den Hoven visited the church and missed seeing an image of the saint. This led him to creating the icon of St Brendan.